Hola y Bienvenidos! Are you ready to be inspired to cook at home, try new recipes, meet chefs, foodies and artisans from around the world? Diving into my Latina roots, I use my magical molcajete, wood pit and other tools and techniques that make my guacamole, crunchy tacos, chorizo y queso fundido molcajete, chimichangas, spicy slow grilled ribs, and so much more taste like grandma used to make back in Mexico. My guest chefs and familia share their inspiring stories that led them to create cookie art, Churro cupcakes, Mexican chocolate brownies, sweet potato flautas, pumpkin tamales, and other delicious culinary creations. Warning, most of our podcasts will make you hungry and you may find yourself dancing in your kitchen to salsa music. Eat before listening or have snacks nearby as we celebrate sharing home-cooked meals with friends and family for food is love! Saludos & Abrazos, Molé Mama. 037: Molé Mama & Mexi Papa Adventures chat about his restaurant ratings! 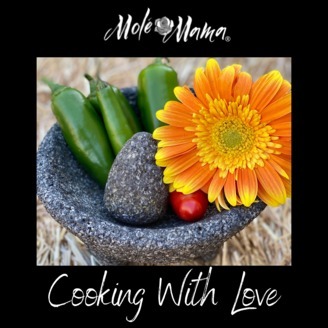 036: Molé Mama celebrates her favorite fruit; Haas avocados, recipes, nutrients and more! 033: Molé Mama chats with fabulous cookie artist, Aliciasdelicas. 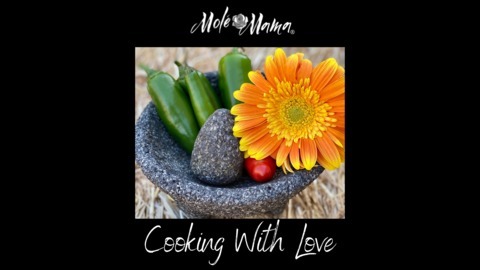 031: Join Molé Mama and Eva Zermeño to learn how to make shrimp tacos, abondigas, black beans, salsa fresca and more.